American readers have an almost insatiable appetite for all things legal. This is evidenced by the popularity of authors such as John Grisham and Scott Turow, as well as tie-in novels based on popular courtroom television dramas such as "Boston Legal," "CSI," and "Law & Order." Attorney and blogger J. Craig Williams taps into that appetite in How to Get Sued©; , a witty look at the American court system. Aimed at the attorney or intelligent casual reader seeking some light diversion, this satirical how-to is sophisticated enough to appeal to the average reader who enjoys sharp wit and some of the more bizarre twists the legal system takes without covering the humor with a thick layer of obscure jargon. It also, though, is helpful while being clever—and it tackles a subject that many pundits like to rail against: namely, our litigious society. Published by Kaplan Publishing, the 272-page hardcover book is available online and at major bookstores. From the top 10 ways to get sued to the unwritten rules for dealing with judges, author J. Craig Williams shines an irreverent light on America’s court system. The author of the popular blog "May It Please the Court®," Williams puts together an entertaining, accessible take on the world of litigation. Readers will walk away amused and enlightened, and with a better view of what the world of litigation is really like in America’s courtrooms. As Ninth Circuit Court of Appeals Chief Judge Alex Kozinski writes in the book's foreword, "There's a certain schadenfreude aspect to reading the cases J. Craig Williams has collected. But it's not just the misfortune of others that is chronicled here, but also their very human weaknesses and foibles -- and their hysterical efforts to overcome them once they get trapped inside the litigation machine. Just as it’s hard to avert your eyes from a train wreck, it’s very difficult to put down a book that repeatedly illustrates not only how easily one can be swept into the sausage factory, but how hilariously difficult and Byzantine things can become once there." 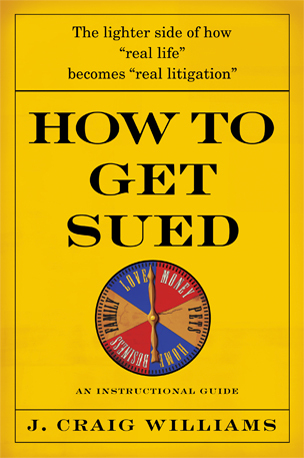 Click on the logo below to purchase your copy of How to Get Sued©. How to Get Sued site development by Pixel8 Media. © 2009 J. Craig Williams. All rights reserved.